Truck accidents are unfortunately quite a bit more common than we might like. If you or a loved one has been in a truck accident, you know how devastating it can be. Not only are you at risk for personal injury, permanent disability, loss of a loved one, changes in standard of living or inability to work, but the trauma alone from having been in an accident is also enough to scar for life. If you have been the victim of a truck accident, don’t wait to get the help you need today. Call 770-823-2711 to discuss your case for free with an attorney at Williams & Williams Law Firm. We proudly serve clients in Alpharetta, throughout Atlanta and other areas of Georgia. The consequences of a truck accident can be much more serious than what typically happens between two cars. This is particularly the case in the case of commercial trucks, which are mammoth compared to personal trucks. 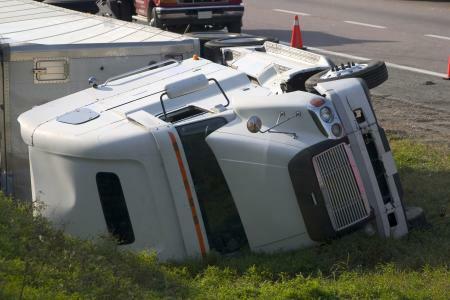 Crashes between two semis or between semis and automobiles are likely to end in loss of life, and certainly in injury. Because a commercial truck can weigh as much as 25 times as much as a car, when its load is taken into account, the results of a wreck are far more catastrophic. According to a survey from the U.S. Department of Transportation, large truck crashes accounted for 4,995 fatalities and 106,000 injuries in 2006, making them among the most lethal of the accident types. Depending on what the truck is carrying – such as flammable or hazardous materials – the consequences may be even more severe. If you can show both of these, there is a good chance you can win your suit. But you will still need the help of an experienced lawyer to put your case together and bring it to court with the best chances of winning. If you or a loved one has been in an accident with a commercial truck, you may be eligible for compensation due to injuries. If you would like to bring a case against the responsible party for truck accidents, you should get in touch with Williams & Williams Law Firm at 770-823-2711 or via email. We would be happy to help you today, beginning with a free consultation.